Like another Cryptologic online slot set in the world of miniature characters - the insect-themed Rickety Cricket - Roamin’ Gnome is full of charm, some lively and colorful graphics, and some nice, if unspectacular, wins. 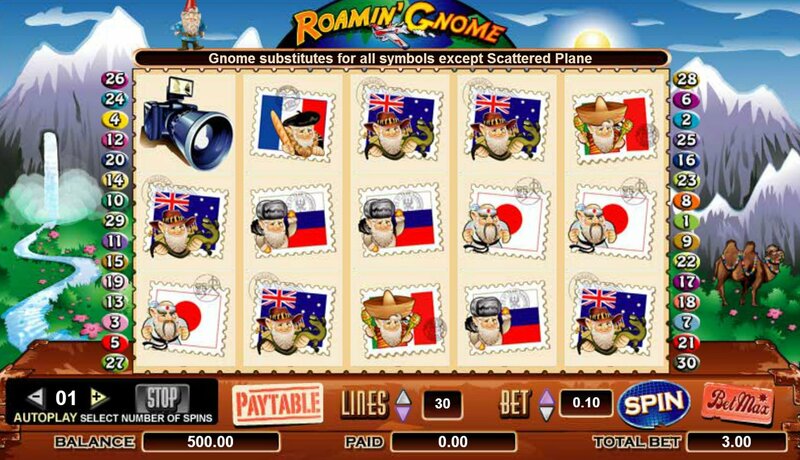 A 5-reel, 30-payline slot played out over five reels, Roamin’ Gnome has coin bets starting at $0.10, therefore making it a little higher on a lot of slots players’ wallet radars than some other games from this developer. 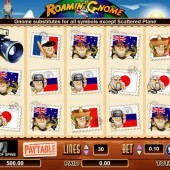 But betting aside, Roamin' Gnome has some pretty amazing jackpots on offer. The red-hatted gnome is Wild and subs for all regular symbols in teh game other than the Scatter. Five Wilds pays out a 5,000-coin jackpot. Next best is the Passport which pays 2,500 coins when you hit five on the reels. Elsewhere on the reels you’ll find a toy plane, a suitcase, a camera, a snow globe, then a series of flags with various holiday destinations: Britain (with a gnome dressed as a soldier); Mexico (a gnome in a sombrero); France (a beret, a loaf of French bread); Japan (a Sumo wrestler); Russia (a furry hat) and Australia (a crocodile). There’s some no-nonsense, unspectacular animation on the reels when you hit a winning combo. But look out for the animated gnome above the reels; when he appears above a reel containing a Wild he will trigger the Roamin’ Gnome Bonus. In this feature the entire reel will become Wild. This game is all about travel (hey, even mythical creatures have to take a break sometimes) and so there is a “Holiday Feature” which is triggered by hitting three or more Scattered Plane icons anywhere on the reels. At the start of the bonus you get to pick three travel destinations for the gnome to go globetrotting to. Each destination you pick will reveal cash or free spins, and free spins wins are doubled. The graphics and theme are pleasant enough in Roamin’ Gnome, if hardly breathtaking, but what’s more worrying is that the bonus feature doesn’t trigger that much. The Roamin’ Gnome bonus is pretty good, however, and I did find myself getting plenty of Stacked Wild reels during the base game.